Spendor A6R review | What Hi-Fi? When a manufacturer revises a product we love, it’s always going to go one of two ways. Luckily, in the case of the Spendor A6Rs, the result is all good. 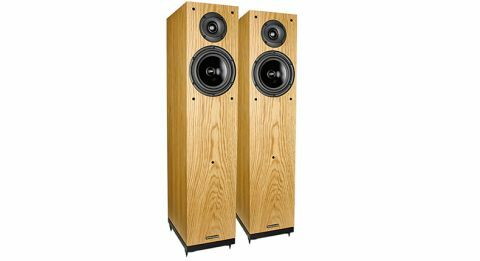 The Award-winning Spendor A6 speakers from 2009 have been given a makeover, with big changes including a new mid/bass drive-unit and a re-engineered crossover. You’d never know it to look at them, though, as they keep the same compact, understated design as their predecessors. There’s a lot of the A6 charm in these new speakers. The musical ability is very much still there, and the A6Rs show a keen interest in making any music you throw at them feel right at home. They put in a superb performance across the frequency range, showcasing a surprisingly deep and punchy low end alongside an expressive midrange and a detailed, refined treble. Each feels like a well-judged part of a whole, slotting together perfectly to produce a well-balanced, coherent listen. This is in no small part down to that new 18cm mid/bass driver, which uses materials developed for Spendor’s much pricier D7 speakers. Detail is second to none too, and there is layer upon layer of subtlety and fine detail to grasp onto. Notes have depth and dimension, nuances are picked up in all their glory and vocals are conveyed with all the reality and emotion with which they were recorded. The original A6s were never dynamic slouches, but the A6Rs show another level of dynamic attack that outshines even our Award-winning PMC Twenty 23s. They keep a strong grasp on bouncing basslines, with a low end that’s both punchy and agile enough to keep up with the energy found elsewhere in the frequency range. Listen to Miley Cyrus’s Wrecking Ball and the A6Rs do a great job of contrasting the powerful choruses against the quieter, more melancholy verses. They’re not scared of going quiet either, something that really makes all the difference when building momentum in a track. And just try to fluster them – you’ll quickly find it’s next to impossible. From giving them full-on orchestral pieces to feast on to challenging them with something like DJ Shadow’s beat-shifting Organ Donor, they never lose their cool or composure. Their upfront character does require some consideration when it comes to system matching, though. The treble stayed just on the right side of bright and aggressive when we were testing them with our reference Bryston and Naim kit, but matching with a similarly forward amp could tip the scale into hardness – something worth considering if you’re building a system from scratch. The Spendor A6Rs are a fantastic pair of speakers that manage to do so much right and very little wrong. They won’t go as loud as something like the Tannoy Precision 6.4s, but they’ll go pretty close challenging for scale and stereo image. Of course, this all comes at a premium that puts them towards the top of the price bracket compared with their competitors. Audition them, though, and you’ll hear where every penny of your money is going.